Can Sir Andy Murray handle the pressure any more? These results are not worthy of holding onto the number one slot and Andy know it too. Why is it so tough to reach number one and even tougher to hold onto it? The herculean effort that it takes to become number one is simply not enough to maintain number one and the constant pressure and expectation of winning every match in every tournament simply gets to the player. Uneasy lies the head with a crown on it and it is mostly the head that gives in first, followed by the will to go out there and give it ones very best in yet another match. In Andy’s case it is also the head that has gone walkabout, and Rome was perhaps his last chance to collect himself and get some matches under his belt before the French Open. 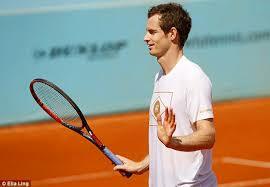 Andy’s ranking could take a serious hit if he is not able to defend his Wimbledon crown from last year. Wimbledon, therefore, will only add to the pressure that Andy already has and may even be the proverbial last straw which may break the camel’s back, much like the Roland Garros was for Novak. However, Novak at least exited with the last hurrah. It seems Novak wanted the French Open trophy so badly that he gave it everything that he had, and had little left thereafter. Did Andy also expend all his emotional and mental grit on attaining the number one rank and then holding onto it for a while? Andy now needs to play and enjoy tennis and simply resign himself to the forgone conclusion of losing his number one position sometime in the very near future. That may help relieve some of the pressure off him, but this is easier said than done. Most can understand that Nadal’s warrior mentality pushes him to give his very best in every match. Moreover, Nadal gets more than his share of extended injury breaks which allow him to get reinvigorated for a comeback. Perhaps all those injury breaks have helped Nadal considerably to extend his career a bit, otherwise with his playing style he could have been done and dusted by 29. However, what really intrigues me is how can Roger continue to enjoy the sport and keep the competitive fire alive after more than 10 years in top ten. What is his magic formula and would he be magnanimous enough to share it with the likes of Djokovic and Murray? ← Shouldn’t fans be celebrating Roger Federer’s decision?